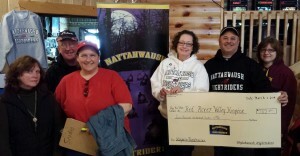 The Naytahwaush Nightriders Sno-Club announced this year’s Ride for Hospice raised $7,112 for Hospice of the Red River Valley. In 10 years of the ride, the Nightriders have raised $68,684 to help provide hospice care to patients and families in Naytahwaush and surrounding areas. This year’s Ride was held in February in conjunction with the MnUSA Winter Snowmobile Rendezvous that attracted 300-plus riders from Minnesota, North Dakota and Canada. The Nightriders were co-hosts of the annual Rendezvous’ featuring more than a dozen trail rides, an awards banquet and a special luncheon for dignitaries with a freewill offering for Hospice. Tom and Ruth McArthur, Dan and Becky Rantanen, Carrot and Judy Paul and Keith and Judy Francis from the Nightriders presented a check to Joy Crouch, Hospice of the Red River Valley development officer, at their annual Snodeo held March 1-2. For more information about future events or membership in the Naytahwaush Nightriders Sno-Club, please visit www.naytahwaushnightriders.com. For more than 40 years, the Naytahwaush Nightriders Sno-Club has been working to promote and advance the sport of snowmobiling. 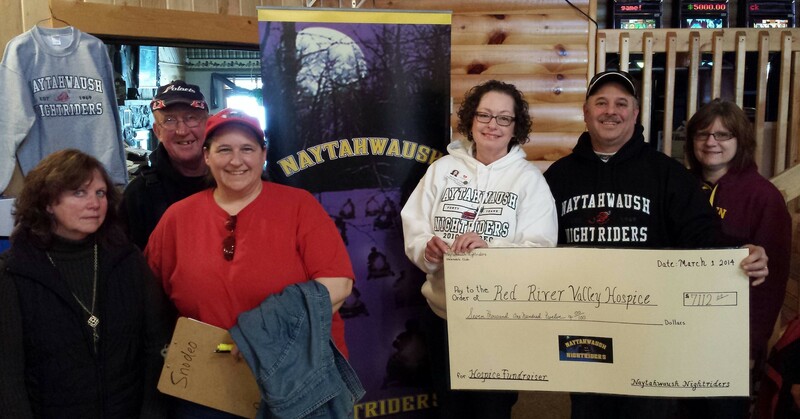 The Naytahwaush Nightriders Sno-Club works with snowmobilers, resorts, businesses, government units and local land owners to develop, build and maintain a network of snowmobile trails for recreational use. The Naytahwaush Nightriders are proud to be affiliated with MnUSA (Minnesota United Snowmobiling Association).